The signs suggest that the reader stumbles upon this almost forgotten village sometime after the fall of a kind of Communist utopia; the inhabitants of this village are the ones that got left behind – the lame, the poverty stricken, those without the get up and go to get up and go. These villagers are actually the former employees of a large estate, their employers having long since departed; perhaps ingrained with an attitude of subservience, the villagers linger in there almost squalid surroundings waiting for something to happen. Then Irimias, a man believed to have died some eighteen years ago, returns to the village. His apparent resurrection fills the villagers with a sense of optimism that life will get better but is he really the saviour the villagers have been waiting for? ‘Style over substance’ is an expression usually used in a critical way but in the case of Satantango it can be used less harshly. Readers expecting a traditional plot driven novel will be disappointed and I can’t pretend not to have been disappointed myself. The structure, too, is unconventional and distinctive, divided into two main parts, each with six sections which in the first section are numbered I to VI and in the second VI to I. This unusual structure imitates the rhythm of the tango, a dance not unlike the traditional Hungarian folkdance the ‘csardas’. This symbolism is a perfect match for a story in which the characters seemingly dance round each other, at times slowly, at others in a fast tempo; as with most structured dances each cycle sees a return to the beginning and in Satantango the characters side step each other but ultimately return to the same impasse. I was initially a little confused by the reference to the tango in the book’s title because I’d always thought of that dance as telling a story and I felt quite strongly that Satantango is a collection of scenes and not a ‘story’; however, thinking of how the tango supposedly tells a story of the relationship between a prostitute and her pimp, this fits more comfortably in the case of the villagers and Irimias who returns to call the shots. At first I found the uncertainty of the plot and the setting – both time and place – quite intriguing. There’s a cast of colourful characters, some appearing in person, others by reference, and I looked forward to finding out how they would develop but this never really happens and most characters are never more than hazily sketched. Perhaps I’m old fashioned in that I want to read a novel in which I like at least a couple of characters but the ones here are largely unlikeable. Mrs. Schmidt is a free and easy slattern, lusted after by those men in the village who haven’t shared her bed, mocked by those that have; there’s an alcoholic village doctor; even the disabled elicit little sympathy, this is a village of flawed people, and sometimes in the most grotesque ways. One might expect there to be only relentless misery in this bleak setting populated by horrible people but there are moments of unexpected humour, mostly from the ridiculous bickering between the villagers as they try to figure out what to do next. Mostly, though, I was irritated. As the villagers desperately turn to superstitions, trying to make sense of their world by finding symbolism and significance in everything that happens, the feeling of gloom only increases and with the cyclical structure of the narrative I felt myself as much bogged down in mud, struggling to hold on, as the villagers. The prose is undeniably rich and descriptive but Krasznahorkai’s sentences are very long and I found the going tough. In themselves these long sentences echo the idea of the dance with lots of steps but frustratingly useless in moving the story forward. Much of the dialogue is repetitive or just vapid and I felt at times that in the space of a couple of pages the story wasn’t going anywhere. 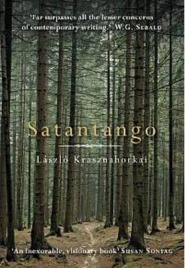 Krasznahorkai has his fans and while I see why many readers greatly admire his work, on the basis of Satantango I don’t think he’s an author that will take up a great deal of space on my own shelves. This is perhaps more indicative of my own predilections as a reader than a criticism of the writer. Readers who are less questioning, or who would wish to find their own answers perhaps, will get along with Satantango better than I did. The style could be described as being more suited to readers who enjoy the getting there more than the arrival; personally I found the ambiguity and slow progress frustrating and disheartening but fans of dark, visionary fiction will, I know, love it. Thanks to Atlantic Books for sending a review copy.